Since the dawn of time, Massage, Essential Oils, and the Sea Elements have been acknowledged as powerfully helpful to enhance your well being. Whether you are needing rehabilitation, rejuvenation, or a respite into quiescence, discover just how youthful and vibrant you can feel once again. To learn more about me, please take a moment to click on the "Spirit's Inspiration" button. 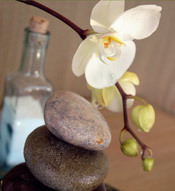 To learn about the healing techniques I have mastered and personalized for you, visit the "Therapeutic Massage" or "Tranquility Spa" pages. If you’d like to request an appointment with me in the West Des Moines, Iowa area, just click on the "Request a Session" page. I will call or email you to confirm the details of your appointment, and also answer any questions you might have. Click on the "Contact Me" button if you have any other questions. I will respond as soon as possible. I am looking forward to working with you, and together rediscovering the joy of vibrant health in mind, body, and spirit.